1. You realize the power of Lordship over you. 2. You realize your abject servanthood and your complete state of resignation and brokenness before the Will & Power of Allah. 3. Sincerity to Allah because you have no place of return in putting off or defending against the calamities except to Him. 4. You return to Allah and are suddenly fervent in your desire of your Lord. 5. It leads to a humbled state before Allah and more prayers through which you’re calling on Allah. 6. You’re forbearing towards the one who has afflicted you (you gain the ability to show forbearance). 7. You get to forgive someone (“and Allah loves those who pardon others”). It is the greatest forgiveness when you forgive people who have caused you great calamities. 8. 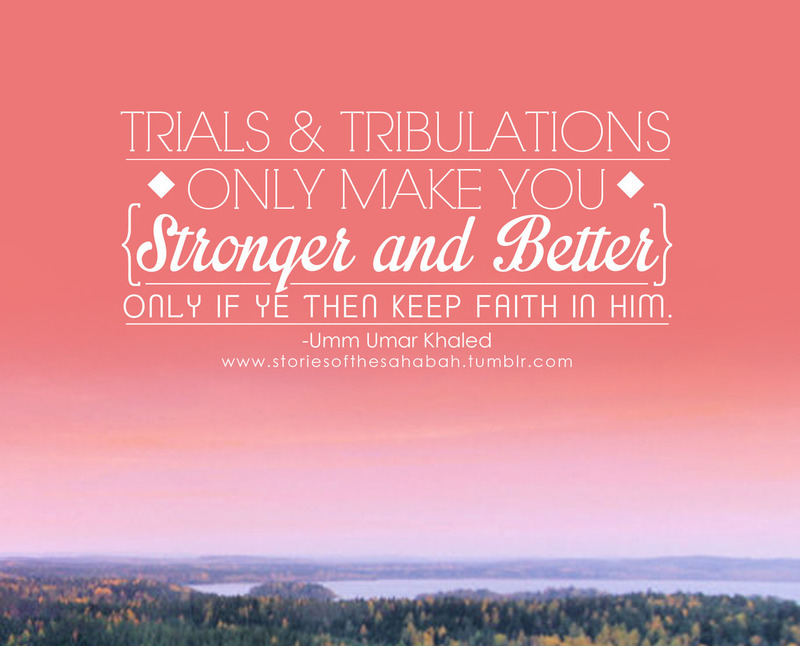 You are patient during the tribulation (“and Allah is with the patient ones”). 9. You can become happy about what’s happening because you’re thinking about all these benefits. 10. You can be grateful for the tribulation because of the rewards gained from it. 11. The purification that these calamities have from your wrongs and your sins (ex: a believer is rewarded for any pain he experiences, even the prick of a thorn). 12. The compassion that Allah enables you to show to others in tribulation and the ability to help them. 13. They give you the Blessing of having the true knowledge of the extent of well-being and what it is. 14. Allah has prepared Rewards for the calamities dependent on how you dealt with them. 15. What is hidden inside the Blessings of the folds of these calamities (ex: Allah may love a thing you hate and may hate a thing you love). 16. They prevent you from arrogance, evil, pride, and tyranny. –excerpted from Hamza Yusuf’s Lecture by Sister Sarah K.